The further deployment of the controversial US missile defense system is on hold, Cheong Wa Dae confirmed Wednesday, while South Korea conducts a proper environmental impact assessment on the project site. “We won’t do anything to (the two launchers) already deployed, but when it comes to the additional deployment (of four launchers), we have to wait for the environmental impact assessment,” a senior Cheong Wa Dae official told reporters. The presidential office said a full-scale environmental impact assessment, which could take as long as one year, is required by local rules for the Terminal High Altitude Area Defense battery site in Seongju, North Gyeongsang Province. Currently, two THAAD launchers have already been placed there, a move allowed by the previous government which viewed only a small-scale assessment study as necessary. The study was launched last year and is expected to be over soon. The whole THAAD battery site of 700,000 square meters is subject to the environmental review, the presidential office explained. Under the previous Park Geun-hye administration, the Defense Ministry handed over only less than half of the land -- 320,000 square meters -- to the US military in April, planning to provide the remaining 380,000 square meters of land later. The split had made possible for the project to go ahead, cutting short the required environmental review. The announcement came in response to local reports that the battery site is not subject to a full-scale environmental study, because the actual size of the land to be occupied by the THAAD equipment and other military facilities is just 80,000 square meters. “Including a site for a radar and launchers, the whole area handed over (to the USFK) should be viewed as land used for the Defense Ministry’s military project,” said Cheong Wa Dae official, citing the previous court’s decision that upholds the view. According to Cheong Wa Dae, the Supreme Court ruled in 2006 that there is no difference in terms of environmental impact assessment between the land handed over to the military for deploying facilities and a site actually used for military operation. Under the Korean law, any new installation of military equipment or facilities that affect more than 330,000 square meters of land must first undergo an environmental impact assessment before being deployed or built. 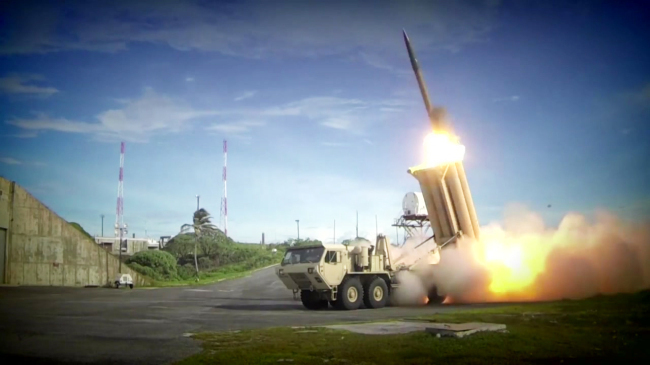 The Cheong Wa Dae official noted that the THAAD deployment is not considered an “urgent matter” that can avoid the environmental impact assessment. The Defense Ministry had claimed that the assessment procedure could be skipped by the defense minister under urgent circumstances. The official went on to criticize the Defense Ministry’s decision to initially provide only 320,000 square meters of battery site to the USFK, criticizing it as an attempt to avoid a full-scale environmental impact assessment. “Unless there is a specific clause that allows us to avoid an environmental impact assessment, (the THAAD deployment) should undergo the assessment procedure and it does not constitute urgent circumstances,” the official said. The government, meanwhile, decided to establish an inter-government agency to ensure transparency in the THAAD deployment. The entity would be attended by deputy ministers for defense, foreign affairs and the environment, along with the Prime Minister’s Secretariat Office. The decision came after a high-profile probe into the Defense Ministry over what the presidential office said was the “intentional omission” of information regarding the arrival of four launchers in South Korea, from the new liberal administration. President Moon Jae-in earlier this week ordered a thorough study on the environmental impact of the THAAD. The anti-missile system consists of at least six launchers with 48 rockets designed to intercept incoming missiles.